First early potatoes are the first potatoes of the year – the tasty ‘new’ baby potatoes that you get in the supermarket, usually at a premium price! The are ready to harvest approximately ten weeks after planting. They can be planted from the end of February to end of May and are suitable for growing in large patio containers. Varieties include Arran Pilot, Swift and Rocket. You can see how I prepared the ground for planting the first earlies in this blog post. Second earlies are ready to harvest about 12-14 weeks after planting and should by planted up about one month after your earlies were planted, to get good crop succession. Varieties include Charlotte (my personal favourite), Maris Peer and Kestrel. Main crop potatoes produce larger potatoes and are ready to harvest approximately 20 weeks after planting. They require more space to grow than the first and second earlies and should be planted in the ground from March to mid May. Varieties include Cara, Maris Piper and King Edwards. 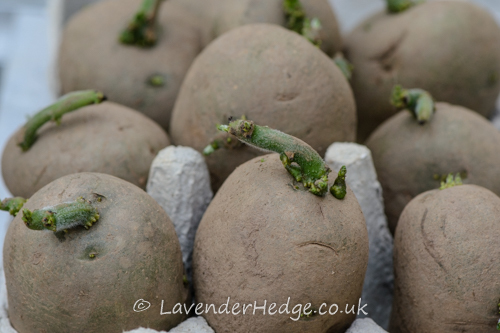 In the past I have opted to buy seed potatoes by the tuber, in order to get a variety of different types, so that whatever the weather throws at us, the chances are one variety will do well. The seed potatoes or ‘tubers’ should be chitted before planting. This simply means encouraging them to sprout by putting them on end, in a light and frost-free place – about 10°C is ideal. Placing them with the eyes upright in old egg boxes will stop them falling over and the shoots getting damaged. After about one month, short green shots will appear and they are ready for planting. If you want large potatoes, then it is recommended that you rub off all but a couple of shoots from each tuber, before planting. If you are after lots of smaller potatoes then leave all the shoots intact.